Every girl needs a pair of our ripped knee skinny jeans for everyday wear! 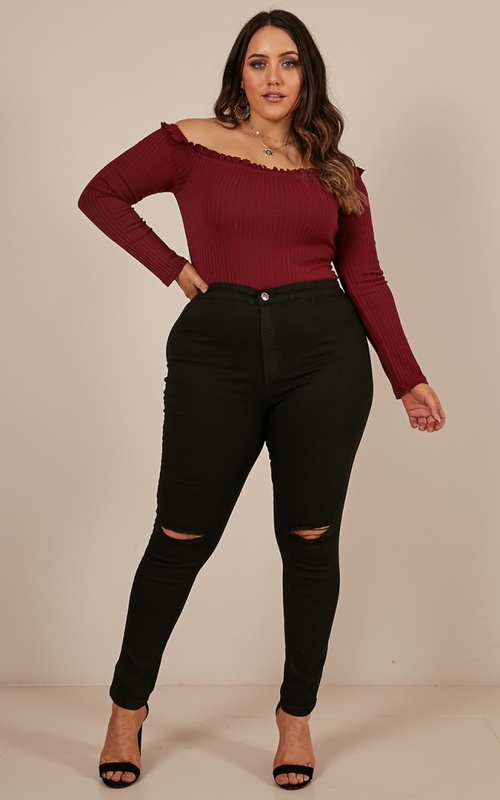 These black high-waisted jeans are super comfortable yet fashionable. Pair it perfectly with a bodycon tee and heeled boots for the perfect weekend vibes. Filter By Height: Show All 5'0" 5'1" 5'3" 5'4" 5'5" 5'6" 5'7" 5'11" 6'0"
Has a bit of stretch, comfy to wear! Not a jean as advertised, more of a jegging. Disappointed at the thin, cheap looking material. Not worth the price. Returned. I ordered these jeans 2 years ago and wanted to reorder because I loved them so much!! - I simply went into my past orders, clicked the jeans and was so happy to see they were still available!! I reordered the same size immediately. THESE ARE NOT THE SAME JEANS. These are made by Showpo. The ones I own were not. I am very frustrated that this wasn't disclosed in the description or even by a NAME CHANGE or something! I feel duped which is annoying because i shop here constantly. true to size but also not?? i loved how easy i was able to move in these jeans, and they fit perfectly everywhere except for the fact that they’re SO high waisted to where they came up my back a bit more than halfway. i love my jeans high waisted but not this much. so i don’t think they’re ideal for someone as short as i am.